Near the beginning of THE BISTI BUSINESS, BJ and his former partner at the Albuquerque Police Department, Lt. Gene Enriquez, quiz the staff at the Sheraton Hotel on Louisiana and Menaul NE about two registered guests, Lando Alfano and Dana Norville. BJ has been hired to find Lando, his client’s missing son. During the questioning, a blushing clerk—clearly smitten by the two handsome young men—recalled they had asked about the Turquoise Trail. This scenic back road is an interesting bit of New Mexico landscape, so I thought we’d take a look at it. The sixty-five mile stretch of New Mexico 14 from Tijeras (Scissors in Spanish) to Santa Fe, New Mexico acquired the name of the Turquoise Trail as a result of a contest sponsored by the Albuquerque Chamber of in 1953. On June 15, 2000, it was designated a National Scenic Byway. The paved mountain road is an easy day trip from Albuquerque to Santa Fe. And a return trip via the faster Interstate-25 leaves more time to explore interesting places. Our word trip today, however, won’t make it any farther than the old mining town of Golden. 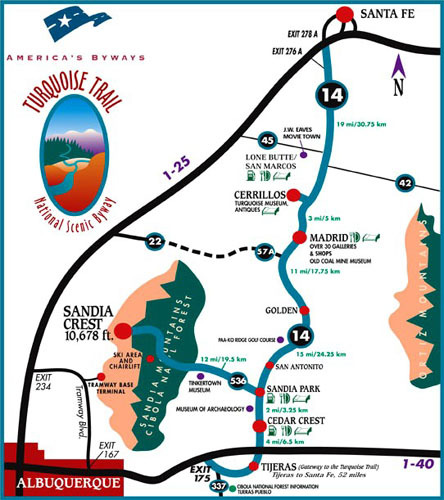 We begin our journey on eastbound Interestate-40 (which parallels historic Route 66) and exit at a small village in Tijeras Canyon, which bisects the Sandia and Manzano Mountain ranges. Actually, BJ and an Albuquerque police sergeant take this same route on a race for Sandia Peak near the climax of THE ZOZOBRA INCIDENT. The village of Tijeras, which had a 2000 census population of four hundred plus souls, is said to have been settled in 1819 when Albuquerque residents moved into the area. But excavations of the ruins of the San Antonio and Tijeras Pueblos confirm the area has been inhabited since the Thirteenth Century, first by Native Americans and later by the Spanish. This is the gateway to the Turquoise Trail from the southern end. NM14 takes you north over a constantly changing landscape of mountains and meadows and high desert and distant buttes through some pretty historic New Mexico locales. We first pass through Cedar Crest, which seems to be a long series of highway strip malls and reach Sandia Park where NM536 will take you to the 10,678-foot Sandia Crest. If we were to turn left here, we’d find the Tinkertown Museum filled with miniature carved figures and animated dioramas and all sorts of western memorabilia. The owner, Ross Ward, has spent four decades carving and collecting what was originally a traveling exhibit to county fairs and carnivals in the ‘60s and ‘70s. It now takes up 22 rooms crammed with wonders of the circus and the west, including a thirty-five foot antique wooden sailboat that braved a ten-year voyage around the world. The collection was once featured on Good Morning America, and the Dalai Lama is said to have visited it. But we bypass the Sandia Peak Scenic Byway and continue north to whiz through the little community of San Antonio (one of at least two villages sharing that name in the state). Beyond San Antonio is the Paako Ridge Golf Course, rated one of the top fifty public courses in the country. The course and the upscale bedroom community that has grown up around it both take their name from the nearby Paako Pueblo ruins. Little of the pueblo remains to be seen today, but there are often university archaeological teams and researchers digging around the area. A few miles farther a dirt track labeled Road 57A, which later becomes Road 22 (go figure), cuts directly west, crosses the San Felipe Pueblo lands, and rejoins I-25. I mention the road because it played a part in THE ZOZOBRA INCIDENT when BJ is drawn off I-25 by a column of black smoke right after someone has tried to kill him. We are now approaching the site of the first gold rush west of the Mississippi. In 1825, years before the California and Colorado gold rushes, placer gold was discovered on Tuerto Creek near the Ortiz Mountains. In the late 1820s, a town called Golden grew up near two mining camps named El Real de San Francisco and Placer del Tuerto. Officially established in 1879, Golden absorbed both mining camps and became the center of a new gold mining district. It boasted several saloons, commercial ventures, a school, and even a stock exchange. The Postal Service opened an office in 1880. Alas, the gold failed and the town dwindled until there was only one general store. Ranching picked up a part of the slack, but in 1928 the post office closed and the town was declared a ghost town. Today, it has a few residents living in restored or newly-constructed homes. I am told the San Francisco Catholic Church (circa 1830) still celebrates mass on the first Sunday of each month. We’ll halt here for the time being and hope we can find one of the many bed-and-breakfast places that have sprung up along the Turquoise Trail. Next week: More of the Turquoise Trail: onward to Madrid. Nice history lesson. Looking forward to more. And anyone in NM who hasn't visited the Tinkertown Museum yet should really check it out!